You probably will be adding various parameters into the brackets such as “row.names=0” or “header=TRUE” or, “sep="\t"“, to make sure you are reading your file correctly. And this is perfectly fine, as a loading method of small datasets. 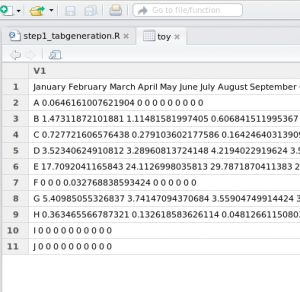 However, to maximize your time, let’s go over the common problems and, more importantly, their solutions new users can encounter when loading a dataset into R.
Solution: This is fairly common. You need to specify the separator! [for .csv files] or even a tabulation (\t) [for .txt file]. Solution: This is rare. But you do need to specify if you table has a header and rownames! This can be achieved by adding header=TRUE and rownames=0 into the read.table() function. Problem #3: My table loaded fine but the data is set to factors. I don’t understand why! Solution: Tell R you don’t want factors! The as.is parameter can help you do that! Note about factors: Although sometimes very useful, this datatype can be very hard to deal with, especially if you want to do calculations on numeric values in your data frame. When using the read.table function, R’s default is set to convert all variables into factors. Problem #4: My table takes a long time to load! R is efficient at loading data only when it knows in advance what you are loading. 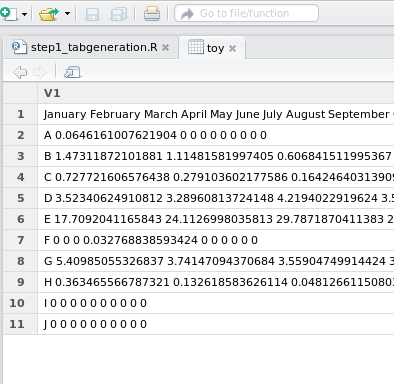 As seen in problem #3, R will automatically convert all string data to factors. This means that the conversion is part of the loading step. Solution: Exactly as seen in problem #3, tell R you don’t want factors! data.txt contains a RNASeq dataset: 21024 genes for 3080 patients. This is a 4 times faster load! You could cut your loading time even more, if you save your loaded table in a RData format (rda). I encourage you to explore other options the read.table() function offers, you might be surprised! A biochemist turned bioinformatician (Masters in progress), I like statistics and machine learning, efficient programs and good coffee.